Important information for customers who already had an account on the previous website. To be able to log in with your old account again, you must now reset your password once or enter it again. To do this, you can use the "Forgot password" function linked here. Today we turn to you with news: Our new webshop is online! Our customers benefit from a contemporary system that improves the comfort in the application. In addition to many updates and improvements the shop is now optimized for all digital devices (cellphones, tablets etc.). To continue logging in with your old account, you must reset or re-enter your password once. In this case please use the link “Forgotten password?”. We hope you enjoy exploring the new titles and, of course, we are always personally at your disposal for any other questions. In 1932, Walter Blunck, from Husum on the North Sea coast, went on a journey to South America, and staying rather longer than planned in Chile, became acquainted with a Chilean doctor, who not only wanted to learn German, but also required a book from Germany. Shortly thereafter a friend of the doctor, who also required a book, got in contact... and so it began. 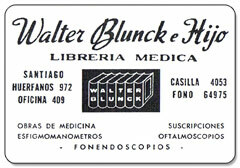 In 1934 the Bookseller Walter Blunck was officially registered in Santiago. During the Second World War Germans abroad were forbidden, by means of a 'black list', from business activities, so instead the family developed a chicken farm on an 8 hectare parcel of land. To this end an indestructible American car was converted into a truck to transport eggs, grapes and such products to Santiago where a lively black market was blossoming. Thus the war years passed. In 1946 books could be imported again, but since no medical advances were to be expected in the foreseeable future from Germany, and German publishers were far too expensive, only American books were in demand. In 1954, at the age of 17, Hans-Dieter Blunck entered his father's business, and developed a speciality within the medical book business for technical literature. Between 1959 and 1961 he gained experience in various publishers and book stores in Europe, getting to know the land and people, including the Hamburg book dealer, Dagmar Funke, who returned with him to Chile. By the year 1971 the business had grown to become the largest book seller in South America (shipping to customers in Chile, Argentina, Uruguay, Peru and Bolivia), and described by the American publishers as “the most spectacular bookstore in the world“ and “the icing on the cake“. After 1971 political restrictions made it impossible to import books, so we moved to Germany, and in 1974 began all over again. In 2000 our daughter Viola Blunck Funke joined the business, thereby continuing the Blunck Family tradition into the third Generation. 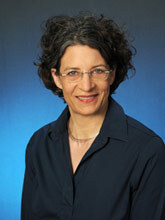 In 2009 the business was entrusted to me, with my parents’ continued advice and support. My father was actively involved well into his 80th year and my mother is still an integral part of the business. Her help is indispensable for me. I am deeply grateful for their support and everything they taught me. Our many years of experience as specialist medical booksellers enable us to respond to your specific requirements, advise you personally and anticipate your needs. Professional personal customer service is still most important for us. On one hand our success is based on the fact that we strive to fulfil each book requirement for you, our customer. On the other hand service and individual advice are paramount, resulting in the loyalty of many customers for which we would like to thank you on this occasion. Our efforts to earn and maintain your trust will remain. All product information and prices are subject to change at any time | * VAT included.